I'll be the first to admit that I didn't truly understand orthoK before I attended the excellent Vision By Design conference this year. And I don't think I was the only doctor that thought the principle of orthoK was that you use a contact lens to forcibly press and flatten the central cornea. If this is your working model of orthoK, it's time to totally rethink everything you thought you knew! The biggest myth of orthoK is that the corneal mold or contact lens being used manually presses the cornea flat. In actuality, the lens ideally won't be directly touching any part of the cornea -- there is a minimal amount of tear film underneath the lens at all times, even at the central treatment zone! Typically this area is dark when stained with NaFl dye, making doctors believe it must be an area of touch. But levels of NaFl dye less than 20 microns thick are not visible when viewed via slit lamp, and OCT studies of on-eye relationship between lens and eye prove that there is a very slim tear film layer at all times between the eye and lens. 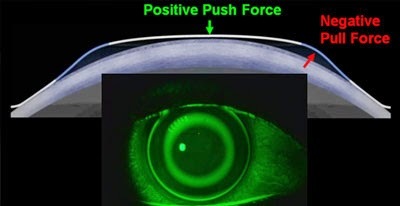 So how does orthoK reshape the cornea if the lens is not actually pressing on the cornea? 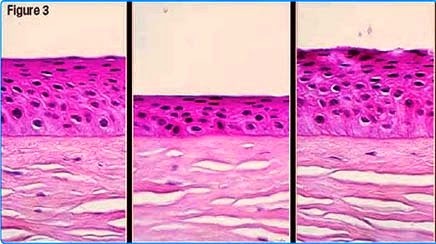 pushing corneal epithelium out of the central cornea and into the mid periphery with ortho K. In actuality, the cells aren't really changing their location, but the fluid within the cells are being redirected. Corneal epithelial cells are connected to each other with a number of different cellular level junctions. Gap junctions are the ones that let orthoK work -- these junctions allow fluid to pass between cells depending on osmolarity and pressure gradient. 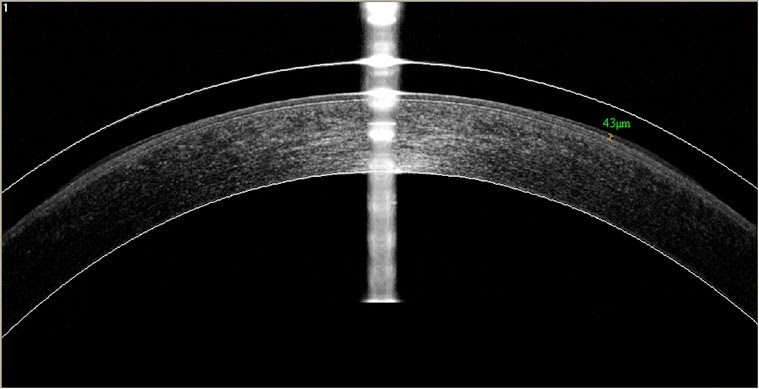 In orthoK the pressure gradient created by the orthokeratology lens shape shifts fluid between these open gap junctions towards the mid peripheral area. 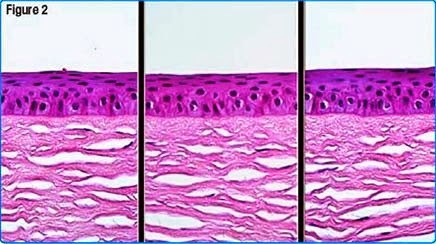 As a result, the corneal epithelial cells centrally in the treatment zone are still present -- there is NO migration or loss of epithelial cells in this area!-- and the flattening effect witnessed is just the fluid movement underneath. Studies show that even after 5 years of orthoK wear, there is no loss or damage to the corneal epithelial cells. What happens when you stop wearing orthoK lenses? Eventually the cornea returns to its natural shape, since the corneal cells themselves have not been manipulated. The amount of time needed to return to normal baseline varies between individuals and prescriptions. Many doctors suggest waiting a period of 6 months without orthoK lens wear if you are wanting to have LASIK or other permanent corneal reshaping surgeries performed to ensure that the cornea is completely returned to its natural state. What we do know is that orthoK is in no way permanent. Any treatment effect you achieve using orthoK lenses will not last when you discontinue lens wear, and your eye is expected to return to the prescription it was before orthokeratology lenses were begun (or potentially with some slight myopic increase if they were begun on a growing child). The largest orthoK study to date, the ongoing SMART study with an enrollment group of 200 children aged 8 to 14 has reported after 3 years of treatment an average progression of -0.17D of myopia in the treated group after 3 years of wear versus -1.01 D of progression in the control group (glasses wear) in 3 years. So while some progression of your prescription will likely still happen with orthoK lens wear, the rate of progression is greatly minimized. Stay tuned for the next post about myopia control theory -- why does orthokeratology work so well at slowing myopia progression? 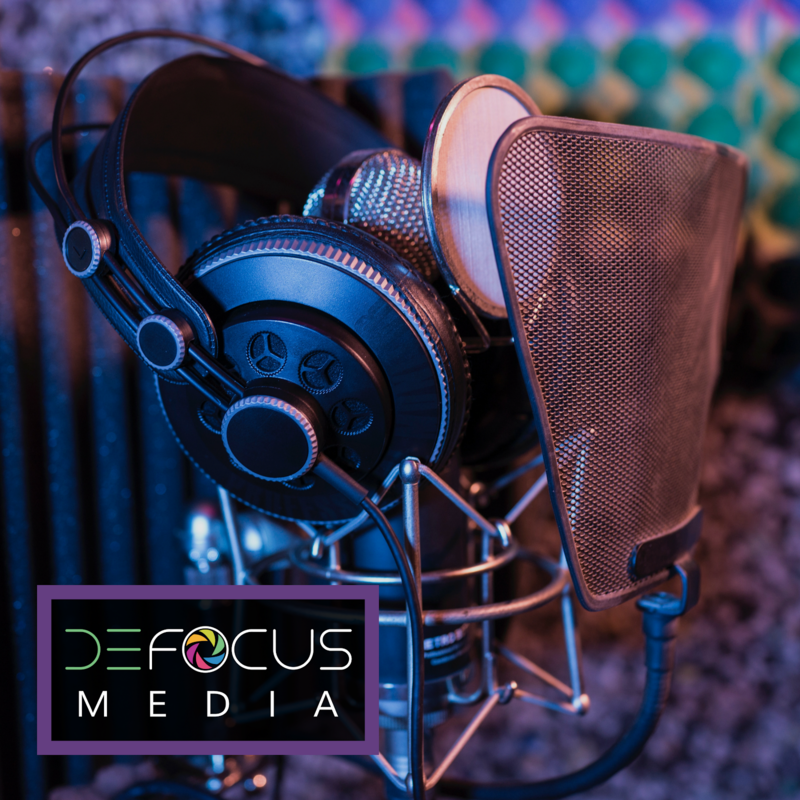 We talk peripheral defocus theory in the next post of this series! I think it's really awesome that this is even a technology that exists. If somebody would have told me about this a few years ago, I would have thought they were crazy. It's really interesting to be able to understand how the process actually works. I would have never really imagined that the lens wouldn't actually touch the cornea, but it does make it more interesting that everything still works the way it does when you consider that. I'll definitely have to tell my cousin about this to see if it could help her with her eyesight problems.